I don’t know how many of you are actually using an ESET product. If you are one of them, I’ve a good news for you. ESET has announced version 5 of their NOD32 antivirus and Smart Security software. I remember the days when ESET quickly roused to the top position in security software business. At that time people were using Windows XP, and they were concerned about the impact of antivirus software on system resources. ESET managed to introduce a lightweight, yet effective NOD32 brand, which attracted a lot people in a short span of time. 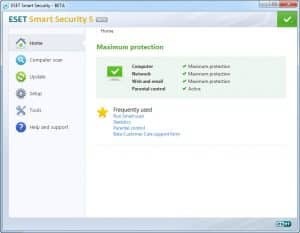 Eventually they launched ESET Smart security, which was a combination of NOD32 Antivirus with Firewall, Anti-Spam and other protection modules found in internet security suites. The software had undergone a major design change in 2010 with version 4. 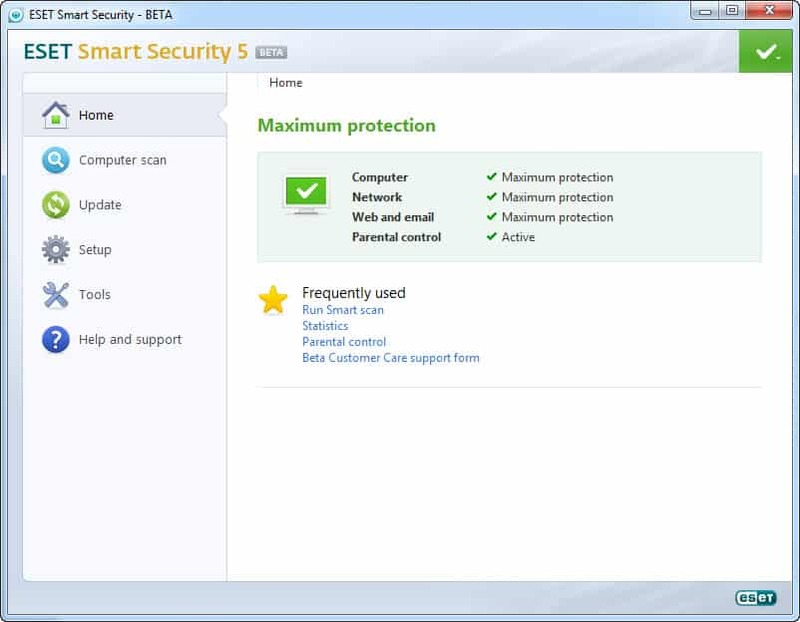 Latest ESET Smart Security 5 and ESET NOD32 Antivirus 5 has a similar but slightly tweaked interface as shown below. Download ESET NOD32 Antivirus 5 here. Download ESET Smart Security 5 here. ESET Smart Security 5 maintains its age old goodness, the scanning speed and cutting edge heuristic detection. It proved to be a great virus fighter in our simple tests. However, the heuristic analyzer classified some of the legitimate program as malware- may be because the software is still in its development stage. The key feature of new product rage is the cloud based malware detection. Interested users can opt for the community based reputation check in ESET Smart Security 5. This is something similar to Norton Network/File Insight, which helps users to identify good files based on community ratings. The new version five also includes a gaming mode, improved firewall and parental controls. During installation make sure that you select custom mode. Then you will get options to detect unwanted applications (like toolbars, adware, etc.) and set firewall rules that are otherwise filled with some default settings. PS: ESET is now running a promo offer on their Indian store for Smart Security and NOD32 Antivirus 4. For more details refer this page. The same username and password can be used with Smart Security 5 when the final version comes out. Hi, i am using Eset smart security 4.2.58 now and it serves great..what are the advantage of having Eset 5? ?